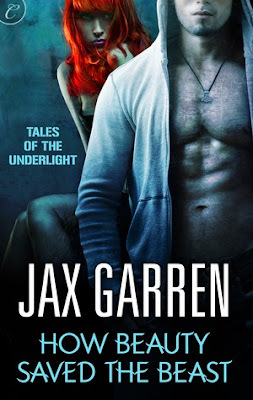 Jax Garren seamlessly pulls readers back into her action packed Tales of the Underlight world. The sequel installment to How Beauty Met the Beast is longer and lovelier with dances around Hauk and Jolie's relationship, a deeper look into Hauk's past, and the inevitable surprising plot twist. Hauk and Jolie's connection to one another is as strong as ever. How Beauty Saved the Beast opens with a very good example of how much closer Hauk and Jolie have become, and how well they've gotten to know each other. I actually liked their dancing around an official relationship because it added a touch of romantic suspense on top of the suspense of not knowing what trouble would befall the Austin Underlight. When Hauk's ex-girlfriend, Ashley, comes into the picture she not only creates tension and jealousy between the two, but gives them both a reason to evaluate their feelings. The introduction of this new character served multiple purposes: showing that there's much more to the Order of Ananke than previously thought, widening our perspective of their goals and resources and giving us the chance to learn more details about Hauk's past. The romance is as hot and spicy as ever, but what really made my jaws drop in this installment was the surprising revelations about Hauk. While he continues to deny the existence of magic and mysticism in his world, he can't deny the uncontrollable rages that he experiences when his Jolie is threatened. The source of this mysterious affliction is unknown, until Hauk is put in a position that means the forfeiting the lives of his friends or the lives of his enemies. I already expected that the Tales of Underlight would, little by little, reveal more beneath the surface of what Jax has already shared, but never did I expect the expertly woven ties to Norse mythology. The Tales of the Underlight is a series to read! Both How Beauty Met the Beast and How Beauty Saved the Beast are highly entertaining fantasy reads with a kick of romance and action that gets stronger and stronger!